Netflix and Marvel revive the character who originated amid the post–civil rights turmoil. As a comic-book fan, I get giddy at the news that another character from the pages I love will be brought to life onscreen, but with it comes anxiety. For comic books, origin stories are always tough. They require a lot of exposition and are necessarily closely tied to the era in which they were created. (Captain America got his start, before WWII, by punching Hitler; Bruce Banner became the Hulk after exposure to a radioactive power source in 1962, just as fears of nuclear weapons and the Cold War were heightened.) And in most cases, adapting a comic-book hero for the modern age requires some character reinvention. With Luke Cage, the post–civil rights character of 1972, however, little change was needed to animate him for the new Netflix series. Coming out of the 1960s and the assassinations of civil-rights leaders like Martin Luther King Jr. and Malcolm X, the imagery of a bulletproof black man was an empowering symbol. In 2016, the immense impact of such representation in the wake of Terence Crutcher, Alfred Olango, and Terrence Sterling (names of a few victims from just the last month) is not lost on audiences. Luke Cage first appeared in Hero for Hire #1 in June 1972. As Marvel Comics’ commercial response to blaxploitation, Cage was written as brash, loud, quick to fight, and depicted wearing chains and metal cuffs. He was part John Shaft and part Muhammad Ali, and even today the early Cage comics read as though Isaac Hayes is playing in the background. Cheo Hodari Coker, the creator of the Netflix series, didn’t shy away from those influences; in fact, he stayed close to the original’s cultural tone. The new series opens in a Harlem barbershop belonging to Cage’s father-in-law, where a multigenerational group of black men is discussing sports and cultural figures, referencing Michael Jordan, Muhammad Ali, Pat Riley, and Al Pacino (who’s earned a spot on the no-pay list because “The Godfather and Scarface guarantee that man an eternal ghetto pass”). 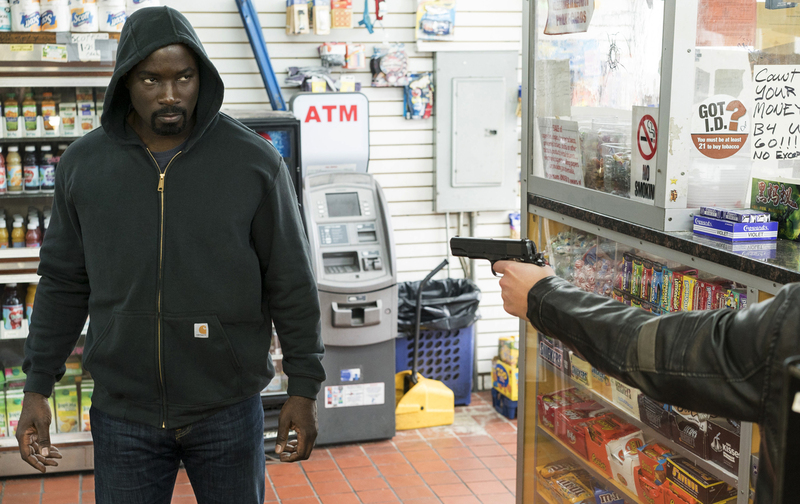 Luke Cage’s departure from the mercenary lifestyle is a marker for a more politically and socially aware story. Cage’s departure from the mercenary lifestyle serves as a marker for a more politically and socially aware story. Coker and his writers don’t shy away from the controversial topics, touching on everything from police brutality and Black Lives Matter to religion, consumer culture, and corrupt politics. Through a series of flashbacks in episode 4, Coker reveals how the bulletproof man was created. Both in the comics and on the show, Luke Cage—born Carl Lucas—had been incarcerated at Seagate Prison after being framed (for drug possession in the comics, grand theft in the series), and takes part in an experimental procedure that predictably goes awry, causing Cage to get his powers. In the comics, Cage (in a nod to Captain America) volunteers for the experiment in order to get early parole, but on the show, he is given no such option. Instead, Cage is blackmailed into an inmate fight club orchestrated by the guards who stream the brawls online for paying audiences. The slightly changed circumstances around Cage’s origin in prison are more than just an updated version of events for 2016; they speak to the murders of black men and women at the hands of authority figures that appear online in raw footage on an all too frequent basis. As we go through the season, Coker continues to allude to these public displays of violence, from Cage’s battle “uniform” of a black hoodie (usually riddled with bullet holes) to the final “big bad” fight at the end of the series, which takes place in the streets, surrounded by chanting crowds. Cottonmouth, on the other hand, while clearly smart and cunning, is burdened by his emotions and his loyalties along with his blind desire for power. Coker’s depiction of Cottonmouth stands out among the other characters’; close-ups and framed shots frequently make him appear notable. He’s often shown watching down over the dance floor of his nightclub Harlem Paradise from his private office, through a large round window, and in front of a large canvas painting of Biggie wearing a crown, giving the audience the illusion that the crown is atop Cottonmouth’s head. In episode 5, the artist Jidenna performs his song “Long Live the Chief” to an empty club while Cottonmouth watches from his perch above, and Coker keeps the camera tight on Cottonmouth as he listens to Jidenna rap: “Niggas fighting over rings / Niggas wanna be the King, but / Long live the Chief / For a li’l ol’ thang, lil’ boys bang bang / Long live the Chief.” Ultimately, in a fit of rage, Mariah kills Cottonmouth, and with some help, frames Cage for his murder. Decades ago, Marvel co-opted the trappings of blaxploitation. And today’s co-opting of wokeness might better reflect substantive gains: To many, Coker’s adaptation of Luke Cage contributes to the perception that Marvel is seriously invested in expanding its audience. Earlier this year, the company hired writers Ta-Nehisi Coates, Roxanne Gay, and Yona Harvey. And it published Coates’s Black Panther in September. But you can’t help but keep in mind that Marvel, like Luke Cage himself, knows well that the game is rigged. Loren A. LynchLoren A. Lynch is the development director at the Texas Observer. She writes about the intersection of politics and pop culture, comics, television, and film.